Now that I have committed myself to inking up this summer in Amsterdam (after telling not only my husband and best friends but also 150 teenagers, there is no backing down), I'm busy trying to figure out what I want drawn onto my skin forever. I know I don't want anything cutesy sweet - that seems just plain silly unless it has a fascinating story behind it and even then I would feel compelled to tell everyone my fascinating story which, eventually, would not sound so fascinating after all. Words could be cool - I've entertained "Carpe Diem" since it was the subject of my speech to the seniors last year and [most days] I sincerely try to embrace the philosophy. If I go with this, I then have to decide what kind of font would be most awesome FOREVER. Cursive? Too girly. Lower case? Too casual. Calligraphy? Too hard to read (back to the explaining thing). Argh. 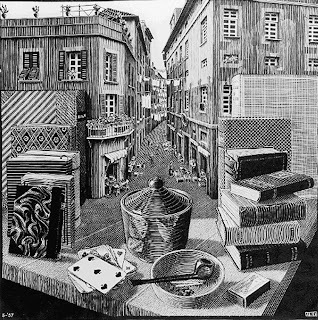 I also thought about an Escher drawing - he's Dutch like me, I'll be in Holland, and I love the intricacy of his work. But I don't think I can sit still long enough for this baby. The woman who does my hair (oh, I told her, too) said the one thing she immediately thought of for me was a book. I like it. Reading has always been a passion - I used to read by passing streetlights in the backseat on road trips; I take or seek out books & magazines everywhere we go (including our honeymoon); I read while brushing my teeth or eating lunch or waiting at traffic lights. But it seems no one else in the history of tattooing has considered such a design. I have entered all of these search terms: book tattoo, book tattoo design, edgy book tattoo, edgy book tatoo design, stack books tattoo, cool book tattoo. To no avail. There are lots of books available showing tattoos, and many people with tattoos of comic book characters & Children of Men book covers. Really? Am I seriously that geeky? Please feel free to submit your best ideas. They can't possibly be any worse than some of my students' suggestions - A dragon! A pot leaf! Flames would be cool! Apparently I'm teaching Beavis & Butthead's children. The obvious and only choice. Although it is quite difficult to top the pot leaf, I'd like to suggest "Rage, rage against the dying of the light" across your back. That would be so sweet in a swimsuit, no? I have been toying with a tattoo as well. How about some sort of obscure Chinese character? That seems to be all the rage with the actresses nowadays. Just make sure your tattoo artist knows chinese and tattos the intended saying on your back, not something like "Eat my shorts" by accidentally moving a bar in the character to the wrong place. Oh that Cheri she is funny. Not a tattoo fan myself, so I have no thoughts. But I can't wait to see what you come up with. Well, ponder some more and if you need help designing it, Greg can help. Oh! And where is said tattoo going? Cheri's idea is good...how does she think of stuff like that so quickly?!?! and if ever anyone questioned as to "why?" you got it..."oh...just for sowing"!!! But...if you go the Chinese character route...pleasepleaseplease let my husband check the "real" meaning of the kanji before you do it!! We have seen so many really stupid ones that mean less than "eat my shorts"...my hub gets a kick out of some of them!!! Keep us posted on what you decide! Like Jenn's comment, I also am not an ink fan. Good luck on your image search, though! I thought the Wild Oats suggestion was priceless! What is the latin word for book-fellow word geek here. I like the book idea. and I think very few bar tramps tattoo in latin-in case the subject comes up. Remember; no names, places, or dates. Angelina did away with her BILLY BOB tattoo, so that one's open. Oh! There is this chick I know, Tami? Anyway, she is covered in tattoos, Sammy? and she would be a great resource, Bambi? Just the stack of books from that piece could be lovely. It would lend a lot of significance to it. Regardless of WHAT you get, I suggest you do the bold & thoughtful thing and talk to a tattoo artist. You might not be planning to get the work done here, but you could probably pay them for a consult and to draft the piece for you and then you could take the art with you to the artist you see over the summer. you should tatoo that little tiny drawing over your mood for today...the one that says "nerdy". do NOT go that route!!! FUNNY! Just found you through a link on Vintage Thirty (I think - I am wickedly blog-hopping instead of working today, shhh don't tell) and love your post. Will want to know "what and where" when you're done. I've been toying with a "tramp stamp" as my not-so-toattoo friendly friends have been taunting of late. What do THEY know anyway?? Love your blog. Check out the Miami Ink web site, I'm sure they've done at least a couple books on their show. LA ink has a web site too. Both of them have lots of pics to get ideas. Where do you want to put your tattoo? I've had mine for three months now and I am not having regrets, persay, but I don't like how the black ink looks more green now.